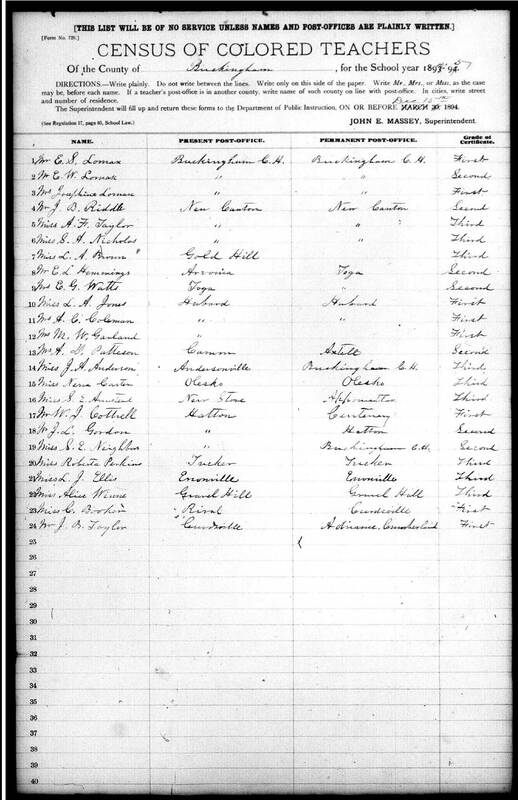 Above is the 1894-1895 “Census of Colored Teachers,” listing the African-American teachers in Buckingham County. Note that there were considerably fewer African-American teachers (24) than there were White teachers (62) working in the county. Members of the Lomax family of Buckingham Court House were leaders in Buckingham County’s education of African Americans. In 1894-1895, three of them were teaching at the county seat: Mr. Edward S. Lomax, Mr. E.W. Lomax, and Mrs. Josephine Lomax. Edward S. and Josephine Lomax were married. E.W. Lomax was their son, Eugene. By 1900, their son, Clarence, was also teaching school in Buckingham. Mr. James B. Riddle of New Canton also appears on the census. He was the uncle of Dr. Carter G. Woodson and, in 1926, helped establish Liberty School. The two-room schoolhouse was located near Third Liberty Baptist Church in New Canton and was built at a cost of $2,400. If you recognize a teacher, please leave a comment! I asked my uncle if he thought my grandma (his mom) or great-grandma would have gone here…he mentioned visiting a one-room school in Appomattox, which he says would have been the closest school to our family homestead. The search continues…. Joanne, would you email me info, too? I asked my uncle if he thought my grandma or great-grandma would have gone here…he mentioned visiting a one-room school in Appomattox, which he says would have been the closest school to our family homestead. Thanks in advance! You have so much amazing info! Buckingham Notables: Josephine Lomax | slate river ramblings . . . .